R1999, Patrick O'Connor. 28", M. Medium purple. Styles red purple. Signal is a yellow orange line centered in a large white thumbprint area; darker streak at tip. Dr. Dormon x I. brevicaulis. The brevicaulis background shows in the excellent zigzag stalks. 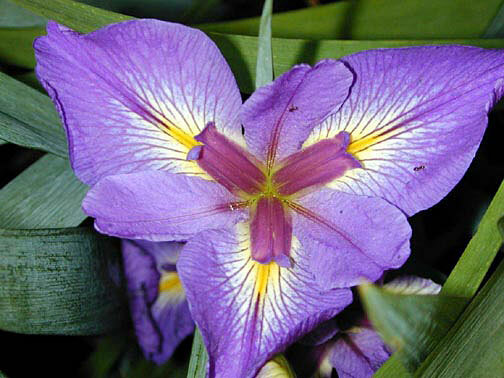 Up to 5-6 positions on a short iris. Good garden show.